Where is Antarctica? How big is Antarctica? Antarctica is the fifth largest of the seven continents. It is a pretty enormous place. It's nearly 14.2 million square kilometers (about 5.5 million square miles) in summer. This is about twice the size of Australia, one and a half times as big the USA and fifty times the size of the UK. It includes the South Pole. Most of it is inside the Antarctic Circle. Antarctica is a very rough circle shape, the long arm of the Antarctic Peninsula stretches towards South America. There are two large seas that eat into the circle. These are the Ross Sea and the Weddell Sea. In the winter Antarctica doubles in size because sea ice builds up around the coast. so is less dispersed. 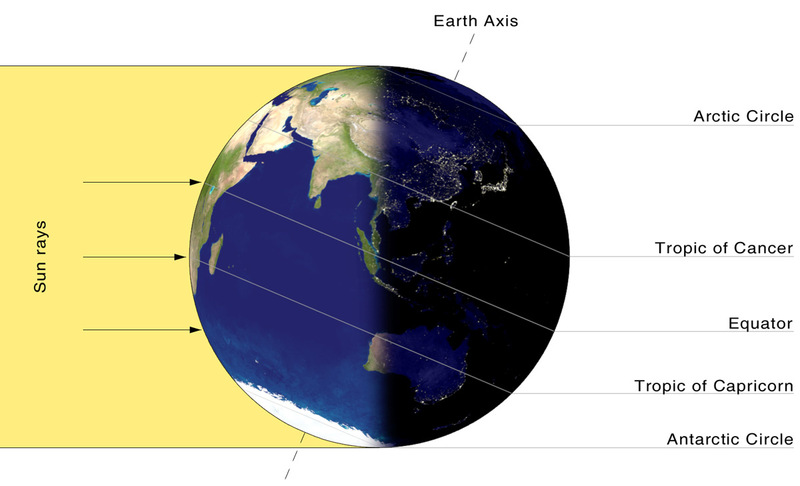 1/ Sunlight strikes the earth straight on (at a right angle) at the equator and then at more of an angle gets as you move away from the equator towards the poles. This means that at the poles the sunlight and heat is spread out more. The tilt of the earth as the seasons go by make an even bigger difference in the winter. 2/ Temperature falls as you go higher at about 1C per 100m. Antarctica is also the highest continent with an average height of 2,300m / 7,546 ft or 1.4 miles. 3/ Antarctica is a large area of land and so apart from at the coasts is not affected by sea temperatures which stop it getting quite so cold for so long as it does in the Arctic. Antarctica is so cold because it is at the pole, is very high and is a large landmass. Why is Antarctica considered to be a desert? A Desert is a place with less than 254 mm (10 in) of annual rainfall. This is what makes Antarctica a desert (even though there are NO camels there!). There is almost no rain in Antarctica - it is so cold it only ever snows. Snow fall is measured in "water equivalent". This is the amount of water you would get if the snow was collected and melted to make water. Antarctica gets only about 50 mm (about 2 in) of "water equivalent" per year, this is less than the Sahara. There is more near the coasts but still only about 200 mm (8 in) of "water equivalent". 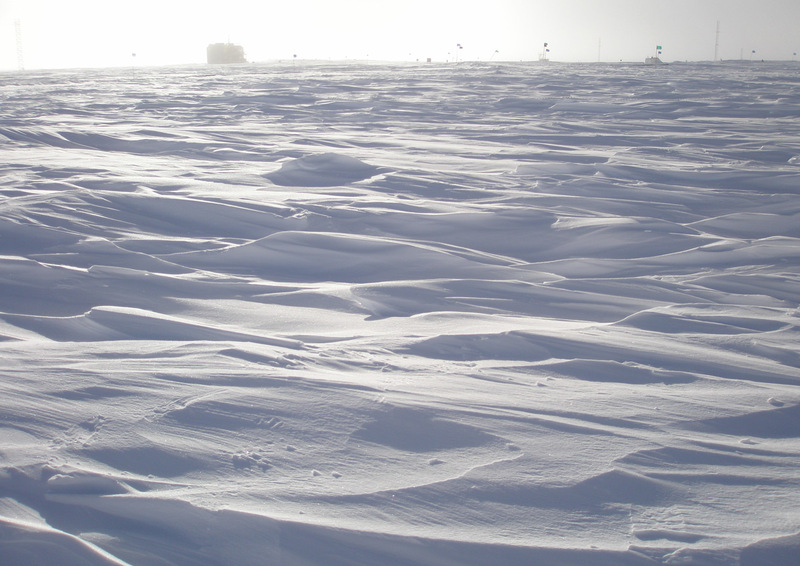 Heavy snow fall can happens when storms pick up water from the seas around Antarctica. This then falls as snow along the coast. The big difference in Antarctica is that unlike other deserts falling water (snow) doesn't dry up and disappear. Even though there is only a small amount of snow falling, it builds up over hundreds and thousands of years into enormous thick ice sheets. What is the climate like? How cold does it get in Antarctica? Antarctica is the coldest, and also the windiest continent. 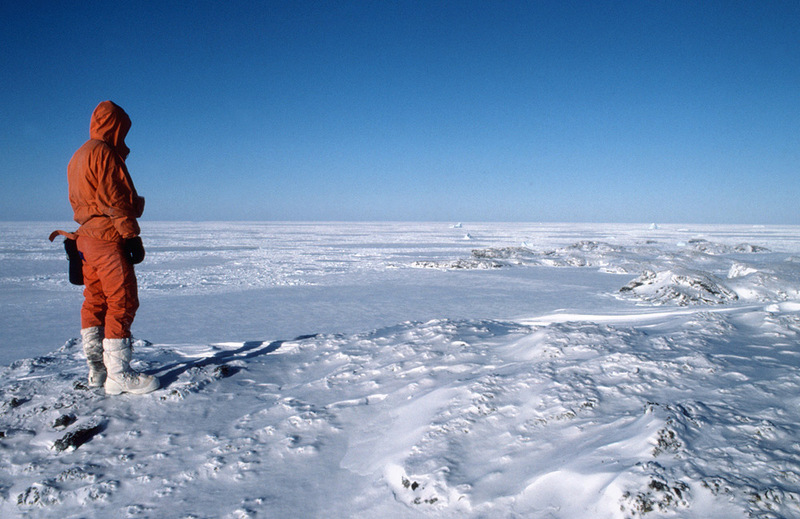 The lowest temperature ever anywhere on earth, -89.2Â° C (-128.6Â° F) was on July 21st 1983 at a Russian base. 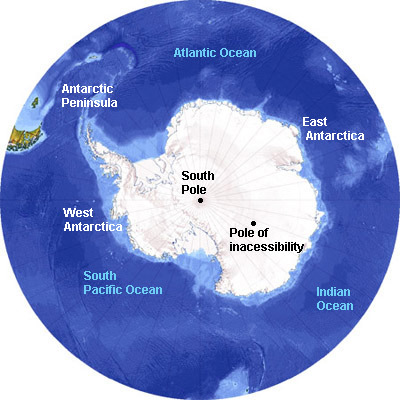 This base is near to the "Pole of Inaccessibility". This is the place on Antarctica that is the furthest from the sea in any direction. Being near to the sea means that temperatures don't usually get really high or low. Being far from the sea means that temperatures in some places in Antarctica can get really cold. Antarctica also gets really strong winds. The wind is almost always blowing. If it stops it will only be for a short time of a few hours. A wind speed of 320 km/h (200 mph) was recorded at a French base in July 1972. There are three climate regions in Antarctica. The interior of the continent is very cold with little snowfall. The coast has warmer temperatures (though still very cold) and much higher snow fall (but still not a lot). The Antarctic Peninsula region which has a warmer and wetter climate, with above-freezing temperatures sometimes. Even though it doesn't actually snow that often it, seems that more snow is falling than there really is. The constant winds pick up snow that has already fallen on the floor and keeps moving it around. Because this happens, blizzards start and make dizzy white-outs - this is when everything goes white with all the snow blowing about the place and you can't even see your mate standing next to you! it's like walking inside a big ping pong ball. There's a story of a day where a base doctor had gone out to visit a penguin rookery about two miles away. When he was going back home the weather had turned bad and he got caught in a white-out! 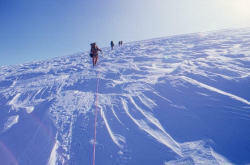 He thought he saw the base cook, going downhill really quickly on a sledge and waving to him from about 150-250 meters. After a few steps, he trod on what he had really seen - a penguin feather stuck in the snow about 10 meters away and blowing in the breeze! Antarctica is made up of of two main areas. East Antarctica and smaller West Antarctica which also has the Antarctic Peninsula. West Antarctica carries on from the Andes mountains stretching from South America. Some people think that if the ice sheet was taken away, West Antarctica would actually be a lots of islands. The tallest bit in Antarctica is 'Vinson Massif' (massive!) it's 4897 m (about 16,066 feet). The lowest bit that people have found so far is the 'Bentley Subglacial Trench' (2499 m/8200 ft below sea level) in West Antarctica, this is a trench in the earth and it's well below sea-level! it is covered with more than 3000 m (more than 9840 ft) of ice and snow! Lower points might exist under the ice, but they haven't been discovered yet. The Eastern and Western halves of Antarctica are split up by the Transantarctic Mountains. This range of mountains stretches across all of Antarctica, large bits of them are buried under the ice cover. If you stood on the great Antarctic ice sheet all you would see is ice and snow (and your friend taking a picture of you on the ice sheet). It would be like being on the top of the sea above loads of underwater mountains! cool eh!? Walking across an ice-sheet, the snow has been blown into ridges, this type of snow is known as "sastrugi" It can be very tiring to walk or ski on and difficult to drive over. It's not a smooth and flat sheet at all though The ice sheet is always moving towards the coast Because of Gravity. Glaciers, huge rivers of ice carry the ice from the middle of Antarctica making ice shelves (gigantic ice cliffs) at the coasts. When a glacier reaches the sea, the ice breaks off which can be a slow quiet event if there is a large slab of already floating ice. If the ice at the coast isn't floating and the glacier is steep ice will break off in chucks making lots of noise and waves. Ice sheets can be very dangerous because they can have some cracks hundreds of feet deep called crevasses, sometimes covered by weak bridges formed of blown snow. 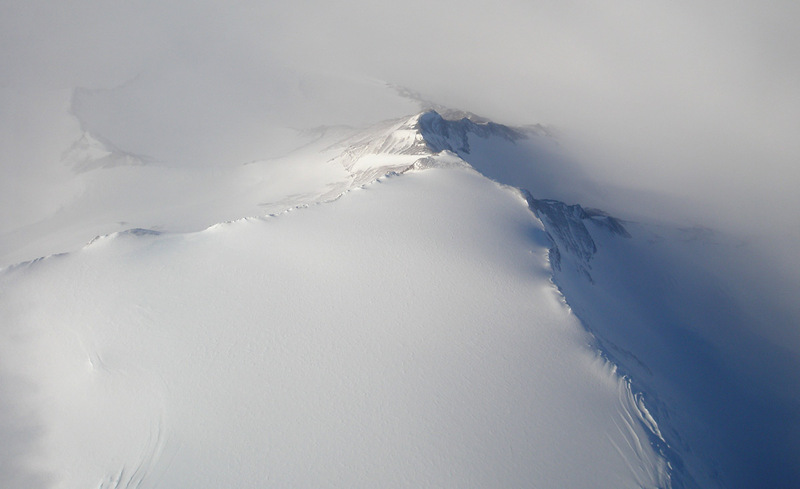 In places, you may see a "Nunatak" rock where one of the taller bits of the mountains peek up through the ice sheet. Like underwater mountains. 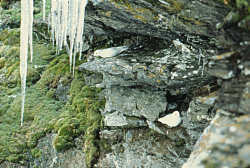 Sometimes 'nunataks' can make a good home for birds like snow petrels, they build their nests here. They do this even though there is nothing for miles and miles around except ice, you can't just nip down to the shops if you get peckish. Nunataks are very useful to geologists (rock scientists) as they can show what the rock is like in that area, because most of the places are covered in ice...as always. Large icebergs build up at the coasts as the edges of the ice shelves and glaciers fall off off into the sea. An ice shelf is made when a large glacier or even several glaciers begin to float when they meet the sea. The largest ice shelf, the Ross Ice Shelf, is the size of the American state of Texas! Ice shelves make the largest icebergs (They're called tabular because they're flat on top...like tables.) as the ice is gently moving onto the top (surface) of the sea and then breaking off and floating. There are at least two active volcanoes in Antarctica! Mount Erebus (3794 m/12,448 ft) is the highest and has a molten lava lake that is there all the time. The other one is on Deception Island, a place where many tourist ships stop off. You can even have a warm bath that is heated by the lava, while having snow, ice and even penguins all around you! Some people think that there might even be another volcano under the ice sheet. In some places glaciers and ice rivers are flowing very quickly this might be because the heat from the volcano is melting the bottom of the ice and making them slide through the water faster. Antarctica has no trees or bushes at all! There are only about 350 plants, and most of them are moss and algae. There are some places where there are lots of plants (like the peninsula). 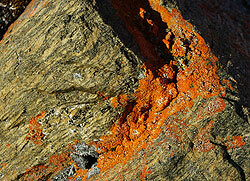 In some places rocks are covered in the vibrant red, orange and yellow growth of lichens. Where the ice has melted off of the rocks in summer, green lichens that grow to a few centimeters high can look like a tatty field of grass. Only three plants with flowers are found in Antarctica. 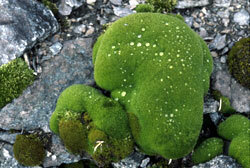 Lichens (in the picture) have been found growing on mountains within 475 km (295 miles) of the South Pole far away from anything! 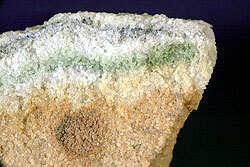 In some places in the Antarctica like the dry valleys, some algae actually grows inside rocks rather than than on them because even though there is practically no light inside them the winds are so cold and strong that the algae prefers to stay inside rather than outside on top of the rocks exposed at the surface. There are no animals in Antarctica that live on land and have a backbone (vertebrates). All the vertebrates (ver-tee-brates) either live in the sea or leave the land in the summer. The largest truly Antarctic land animals are invertebrates ( have no backbone) and are tiny, only a few of millimetres in size. These animals, mites, ticks and worms survive the cold of winter by becoming frozen under rocks. They have antifreeze in their bodies ( like the stuff your mum and dad put on their car windows) This stops them from moving and their body working. They become active and awake again when it gets warmer and the ice melts. The oceans around the Antarctica are full of life. Lots of whales feed on the rich underwater life, especially krill (small animals like shrimps or prawns). Six different types of seals and 12 types of birds live in the Antarctic. if you added up all of the krill it would weigh more than all of the humans in the world. 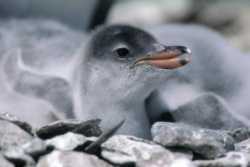 The most famous animal to live in Antarctica is the penguin. They are one of the only birds that can't fly, (like an ostrich) but they are excellent swimmers, penguins live on ice and in the oceans around Antarctica. They breed on the land or ice along the coast and on islands.